richmond, let's add up our efforts for cleaner water faster! RVAH2O.org is an initiative of the City of Richmond’s Department of Public Utilities to educate the community about ways to keep our waterways pollution-free, and the importance of integrating drinking water, wastewater, and stormwater under one watershed management program, so that together, we can achieve cleaner water faster. Learn more about the waterways of RVA and how we’re working to make big improvements. Clean drinking water is essential to all of RVA every day. See what you can do to keep it that way. Understand what stormwater is – and why it’s so important. How does the water in and around your home become wastewater? You may be surprised. Together, we can work to achieve our goal of cleaner water faster for all of Richmond. 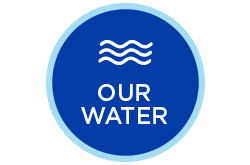 We put together a permit and a plan on how to improve water quality throughout RVA over the next few years – and we would like you to be a part of it! Dive right in and see all the ways that you can connect with RVAH2O!